Summer may be just around the corner but lets face it here in Ireland we won't get much of a Summer will we ? This sweater is extremely versatile and can be worn all year round. its 100% cashmere so it will also be warm. The big polka dot is very cute and trendy in this Spring, I can it can be worn with jeans, leggings, black tulle skirt, red maxi, or put it over dresses. This Equipment cashmere sweater costs €280.12 and is available from shopbop.com. This sweater below is from Forever 21 and costs €24. The Forever 21 sweater is 100% acrylic, so it is not as good quality as the Equipment sweater is. 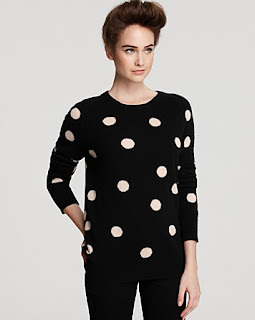 The monochrome polka dot pattern makes it incredibly wearable, it can be worn with virtually any colour. love the second look. I'm going to get this.